Nian Nian You Yu slot machine is an Asian themed game from Playtech that as well as using an exceptionally tedious theme, also is lacking somewhat in appeal. With loads of stereotypical imagery on the mobile slot games the game actually looks ok, and it has a RTP of 97.03%. The main draw of the game is its progressive jackpot and there are no bonus features. Read the Nian Nian You Yu slot review below for more details. We already know that Asian culture is a rich source of inspiration for video slot software providers, but you can’t help but feel the team behind the Nian Nian You Yu slot are phoning it in somewhat at this point. Loosely translating to “plenty of fish”, Nian Nian You Yu is a five-reel, nine-payline game that again draws on typical Chinese iconography as inspiration for its symbols. 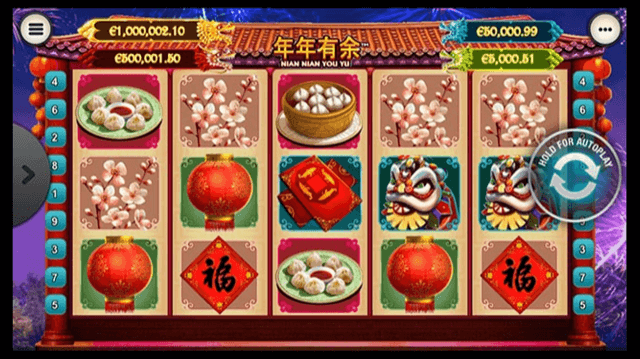 Set to a backdrop of a red pagoda draped in lanterns, unique icons to appear in the game include ceremonial dragons and lions, a bowl of lychees, a plate of dim sum, lanterns, lotus flowers and – of course – a classic string of firecrackers. Playable from as little as £0.09 per spin across all desktop, mobile and tablet devices, the Nian Nian You Yu slot machine is connected to four progressive jackpots that can be triggered on any given spin. On top of that, the slot includes a base game jackpot of 10,000x players’ bet per line amount, meaning it packs plenty of regular prize potential even if it is lacking in bonus features or any other distinguishing qualities. Indeed, this is our major bugbear with Nian Nian You Yu. Aside from its jackpots, the game is completely devoid of extras, with only a koi carp wild symbol and an instant win scatter symbol offering any real deviation from the bog-standard five-reel fare. Wins do at least pay from left-to-right and right-to-left, but in truth this does relatively little to mask the game’s shocking paucity of features. Nevertheless, as there are four progressive jackpots to be won, we might as well talk about them. The jackpot game is a random feature that can be triggered on any real money spin. The more players bet, the better their chances of activating it will be, but technically any stake has a chance of setting it off. Once the jackpot feature is activated, the good news is that players are guaranteed to win one of the amounts displayed in the boxes above the reels. At the start of the game, a prize wheel will spin and the pointer will ultimately end up on one of four colours. Players will then have to keep spinning until any of the colours has been hit three times, at which point they’ll win the associated jackpot payout. The Game For Nian Nian You Yu? We know it’s difficult to keep coming up with original content from the same source material, but the Nian Nian You Yu slot really does set the bar very low in terms of the entertainment it provides to players. For even more Asian themed slots fun the Chinese Kitchen slot is a fun little mobile game. Like our review of the Nian Nian You Yu slot machine? Check out these as well…..